Brace for a bit of recency bias. As it relates to the 2019 NHL draft and my initial Top 124 rankings, I’m admittedly putting a lot of stock in this month’s Hlinka Gretzky Cup. Reality is, that under-18 tournament in Edmonton was the first best-on-best scouting showcase for the 2019 draft year — featuring all the top 2001-born prospects, with the exception of those playing for the U.S. National Team Development Program. Yes, it was a short tournament in the middle of summer and not every prospect was up to speed or in midseason form, but the cream of the crop still rose to the top. At least in my eyes. Granted, there are several highly touted late-2000 prospects eligible for 2019 who also weren’t on display, but those who shone brightest at the Hlinka Gretzky Cup can certainly be considered risers. By no means should scouts discount what these prospects have done in seasons past or discard their pre-tournament rankings. 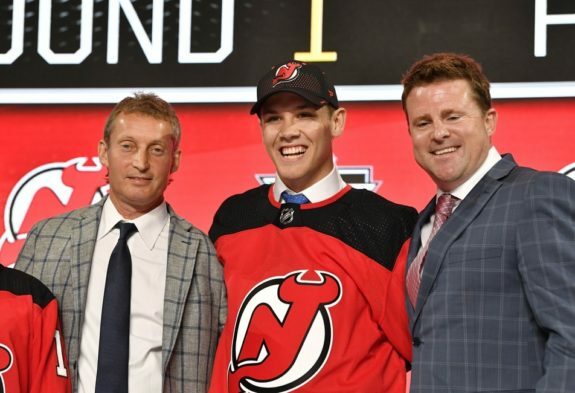 However, it’s important to live in the present and although the Hlinka event is a small sample size, it should be heavily weighted in any preseason rankings as we embark on the 2019 draft year. I realize many scouts are already salivating over a seemingly stacked 2020 draft class — highlighted by Canadian forward Alexis Lafrenière and the dynamic Swedish duo of Lucas Raymond and Alexander Holtz, all of whom were under-age standouts at the Hlinka — but I’m more bullish than most on 2019. That may be the result of some regional bias since I cover the Western Hockey League on a daily basis and 2019 promises to be its best showing in some time and a big bounce-back from 2018 when only two WHLers were selected in the first round and a mere 20 were taken overall. Ty Smith, a puck-moving defenceman for the Spokane Chiefs, was the highest pick from the WHL in this June’s draft, going 17th overall to the New Jersey Devils. The 2019 draft could see a handful of WHL prospects go in the top 15 and upwards of 10 within the top 31. That’s a debate for another day — 2019 versus 2020 — with this list more about recency bias than regional bias, though there could be a correlation between the two. Regardless, I believe 2019 is shaping up to be a stellar class, an underrated class, and definitely a deep class for both skaters and goaltenders. First things first, I have to admit to using a mulligan. This is a first for me since I never alter my current rankings once they have been published based on the feedback that I get. I typically apply that feedback towards future rankings. I don’t hit the publish button until I’m fully confident in my list and my order throughout. However, I had to make a change this time — once it was brought to my attention how low I had Cam York. I really like York, he has lots of upside, and I’ve had him as high as No. 10 at one point. But as I was putting the finishing touches on my list, York somehow slipped into the second round, showing up at No. 39. Yes, that was much too low and a mistake that doesn’t reflect my true opinion of the player. I debated over what to do for a couple hours, but ultimately decided to right that wrong since I didn’t have a good reason for why York appeared outside my first round. Chalk it up to offseason rust, but I felt the need to fix that and to be honest about the change. Truth be told, I often rank the prospects by position and then integrate those groupings. I had York grouped with Honka and Byram coming out of last season, projected to be right around 10th overall. Then I elevated the other two and grouped York with Soderstrom and Kokkonen in that 15th overall range. Perhaps I accidentally identified York as a faller in making that adjustment and he has bounced around my rankings in recent weeks. I do recall dropping York down to the group with Bjornfot and Korczak in the 20th overall range, but that’s as low as I would go with him. That’s where I feel York belongs — somewhere between Nos. 15-25. Not at No. 39, atop that next grouping with Thomson and Thrun, even though York was still my highest-ranked American defenceman at that spot. Long story short, sometimes when you’re shuffling names around in groupings, somebody gets lost in that shuffle. That was the case with York, it was an accident on my part and through no fault of his own, so I’ve since bumped York back up with Soderstrom and Kokkonen — subsequently bumping everybody else down one notch. That is my only change because York should have been ranked as a first-round pick. Of course, I’ve been getting flak for my rankings of other prospects too — particularly Turcotte (12) and Newhook (18). I’m not convinced they will be top-10 picks, and I’m not as infatuated with either of them as many of my fellow independent scouts, but I will be keeping a close eye on both this season. This is my list, as of Aug. 24, through four rounds as I begin the season-long process of working towards my eighth annual NHL mock draft and my fourth year of mocking all seven rounds — all 217 selections. I’m already more than halfway there with 124 names on my preseason rankings — up from my usual 100 — and I’ll likely stick with that number (124) for my midseason and final rankings. I may also publish monthly rankings in the second half once the calendar turns to 2019, starting with my midseason list that will follow the CHL Top Prospects Game and the World Junior Championship tournament. As always, I ask our readers if there are any glaring omissions in my rankings? Is anyone way too high or way too low? Feel free to make your voice heard in the comments below, or reach out to me directly via email at larry.fisher31@gmail.com.